Manchester City has, in truth, eased their way back to the top of the Premier League this evening after a clinical if not dominant derby display was enough to beat Manchester United at Old Trafford. David De Gea was beaten at his near post twice as goals from Bernardo Silva and Leroy Sane earned Pep Guardiola’s side all three points from their game in hand over Premier League title rivals Liverpool. So now we all know where we stand, with just over three weeks of a pulsating season left. If Liverpool is going to win their first Premier League title at the 27th time of asking, they’re going to need something to go wrong at some point 35 miles east. In reality, the Reds will have to win all three of their remaining games, starting with Friday night’s fixture with Huddersfield at Anfield. Liverpool’s continued participation in the Champions League knockout stages always had the potential to work against them from the moment City were dumped from the competition by Spurs last week and Friday could, but shouldn’t, shine a small light on such complications. Jurgen Klopp will have a decision to make. Rest some of his more integral stars, against a relegated side with zero to play for, with next Wednesday’s semi-final first leg with Barcelona on the horizon or gamble on playing his first team and having enough in the tank to go again in four days? Oh, how these two games with the Catalans could shape the whole season for Klopp and company. Less than 72 hours after the Nou Camp fixture, Liverpool will turn out at St James’s Park in a potentially tricky Saturday evening encounter with Newcastle United under the lights. They’ll certainly be hoping for a favor or two from former boss Rafa Benitez, but one would have to suspect that should Liverpool be still in the Champions League tie, at least one eye will be on making a European final. 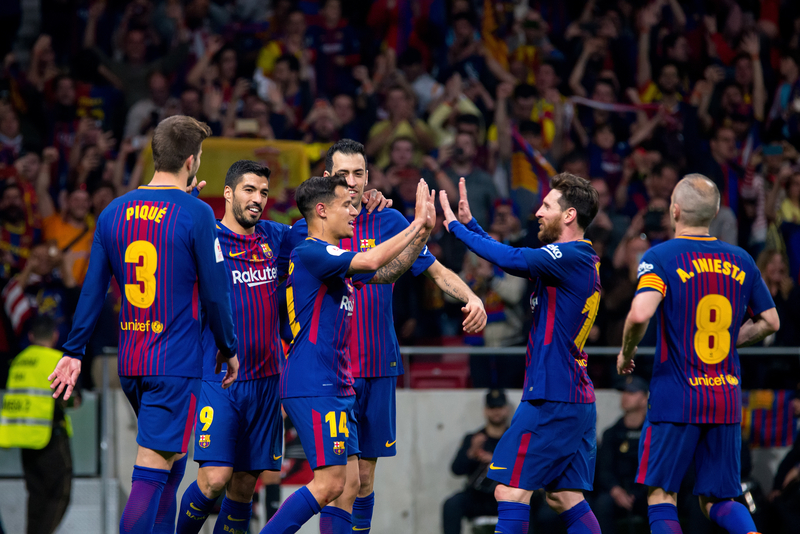 They will welcome the Catalonians for the second leg at Anfield another 72 hours later before wrapping up their season at home to Wolves. The complication of Barcelona is key. Without those two games, one could reasonably expect Liverpool to come away with nine points from their final three games of the domestic calendar. Barring a freak result at Anfield leaving either side way out in front, that showdown on Merseyside on May 7th will dictate what might happen in the North-East three days prior. Despite playing two of their final three league games away from home, City seems to have a far more straight forward path to negotiate. They also have the quite obvious advantage of being a point to the good heading into them. Burnley may prove their most difficult fixture, who after a terrible start to the season have produced some spirited performances of late with the threat of relegation long since shaken from their back. Leicester City at home should be a formality against a Brendan Rodgers side who for most of this season have shipped goals for fun away from the Kingpower Stadium, recent results at Burnley and Huddersfield aside. Last up, City will travel to Brighton and the intricacies of the Premier League fixture web will play a role if we go down to the final day. Brighton still remain perilously close to the trap door, hovering one place above the relegation zone, three points ahead of a Cardiff City side who still have a fighting chance of survival. A crucial game for Cardiff, Brighton and indeed City will be the Bluebirds trip to Fulham this Saturday. Anything less than a win would surely condemn Neil Warnock’s side to the drop, leaving Brighton breathing a lot easier should they get anything from their evening game with Newcastle at home. 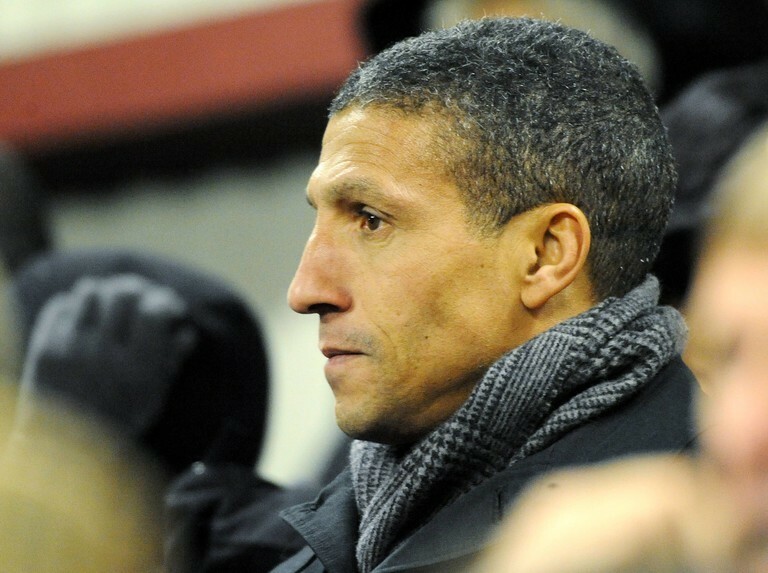 Safe or not safe, the bottom line is Pep Guardiola’s side should really sweep the floor with Chris Hughton’s men with the title on the line. Tonight’s victory at Old Trafford may well have hammered the final nail into Liverpool’s Premier League dreams. Facebook’s financial success continues in the face of countless security and privacy scandals, including a potential record-setting Federal Trade Commission fine. The social media giant is bracing for a massive fine from federal regulators after a year of data privacy scandals. Facebook said Wednesday that it expects an ongoing investigation from the Federal Trade Commission could result in fines ranging from $3 billion to $5 billion. “In the first quarter of 2019, we reasonably estimated a probable loss and recorded an accrual of $3.0 billion in connection with the inquiry of the FTC into our platform and user data practices,” the company said in its earnings release. The company posted first-quarter earnings on Wednesday for 2019 which highlighted a 26% increase in year over year sales, up to $15.1 billion, and increases on monthly and daily users. The earnings release also revealed that Facebook reached 1.56 billion daily active users in March. Facebook ended March with 2.38 billion monthly active users and combined with their other apps, they have 2.7 billion users every month. The United Nations refugee agency evacuated 325 refugees from a detention centre on the southern outskirts of Tripoli amid escalating violence near the Libyan capital. UNHCR said in a statement on Wednesday those rescued from the Qasr bin Ghashir centre were transported to another detention facility in Azzawya, northwestern Libya, where they were “at reduced risk of being caught up” in ongoing fighting between renegade military commander Khalifa Haftar’s eastern forces and troops loyal to the UN-recognised Government of National Accord (GNA). The move was triggered by reports on Tuesday of the use of armed violence against detainees who were protesting against the conditions in which they were being held, UNHCR said, with 12 refugees requiring hospital treatment after being attacked. Wednesday’s evacuation brings to 825 the number of refugees and migrants transferred further from clashes in four operations in the last two weeks, the agency added. “The dangers for refugees and migrants in Tripoli have never been greater than they are at present,” said Matthew Brook, UNHCR’s deputy chief of mission in Libya. We have evacuated 325 refugees from the Qaser Ben Gasheer detention centre in Tripoli. About 3,000 refugees and migrants remain trapped in detention centres in Tripoli, according to the UN, and remain at risk from the “deteriorating security situation” around the capital. Many of the detainees fled war and persecution in their home countries. Tripoli’s southern outskirts have been engulfed by fighting since Haftar’s Libyan National Army (LNA) launched an offensive on April 4 aimed at wresting control of the capital from the GNA, which is supported by an array of local militias. The showdown threatens to further destabilise war-wracked Libya, which splintered into a patchwork of rival power bases following the NATO-backed overthrow of former leader Muammar Gaddafi in 2011 and has been split into rival eastern and western administrations since 2014. Both the LNA and GNA have repeatedly carried out air raids against one another and accuse each other’s forces of targeting civilians. At least 272 have been killed and more than 1,200 others wounded since the LNA started its offensive earlier this month, according to the World Health Organization (WHO). At least 36,000 people have been forced to flee their homes because of the conflict, the UN Office for the Coordination of Humanitarian Affairs (UNOCHA) said on Wednesday. The violence has forced the UN to abandon its plans for a conference aimed at brokering an agreement to hold elections as part of a solution to Libya’s long-running political crisis. The meeting was scheduled to bring Haftar and GNA Prime Minister Fayez al-Serraj together in the country’s southwestern town of Ghadames from April 14 to 16. Al-Sarraj said last week the international community needs to be “united and firm” in supporting him and warned some 800,000 migrants and refugees, as well as Libyan nationals, could flee across the Mediterranean to Europe’s shores if the instability in Libya continues. The UN puts the number of people in Libya who have fled their homelands at more than 700,000. Russia’s leading defense officials have warned of growing conflict around the world and argued that the United States was the source of deteriorating global security. “There are still combat operations in Yemen. Conflict in Libya is entering a new phase. Tensions remain in Syria and Iraq. Terrorist groups are becoming more active in Africa. The western part of this continent is leading in the number of hijacked vessels seized by pirates,” Shoigu added, also claiming that “steps are being taken to push neocolonial interference in the domestic affairs of sovereign states,” including in Afghanistan and Southeast Asia. During a March 2017 interview with NBC News, Russian President Vladimir Putin referred to former President George W. Bush’s exit from the 1972 ABM as “exactly the time and moment” that an “arms race” began between the two top military powers. With the subsequent U.S. suspension of the INF, the Russian leader has threatened to target not only any once-banned missile systems ranging from 310 to 3,420 miles in Europe but their “command centers” in the U.S. as well. Russian officials have also sought to pressure Washington into starting talks to renew another nonproliferation deal, the New Strategic Arms Reduction Treaty (START), that limits their nuclear arsenals. Secretary of State Mike Pompeo told Congress earlier this month that President Donald Trump was interested in launching preliminary talks to extend a treaty slated to expire next year, but—as with the other failing agreements—the two rivals have struggled to find common ground for discussions. In addition to squabbling over missiles and nuclear weapons, the U.S. and Russia were attempting to advance clashing foreign interests in regions such as Africa, Europe, the Middle East and other parts of Asia. The two supported rival factions in conflicts in Syria and eastern Ukraine, which was located near the tense border that separated Russia from members of the U.S.-led NATO Western military alliance. Thousands of miles away in Latin America, Moscow has backed Venezuelan President Nicolás Maduro against U.S.-led attempts to oust him in favor of parliament speaker Juan Guaidó, creating yet another international standoff that has reinforced both the U.S. and Russia’s view of one another as a foe. “The internal political struggle in the United States disallows an opportunity to start a constructive dialogue between Moscow and Washington, provokes the development of anti-Russian hysteria and returns the world back to the Cold War era of confrontation,” Gerasimov added, also warning of a “new missile arms race” should the pair prove unable to strike new nonproliferation accords. The U.S. has arguably been the world’s sole superpower since the collapse of the Soviet Union in the early 1990s, but Putin has sought to challenge this title by developing state-of-the-art weapons such as new cruise and hypersonic missiles said capable of defying even the most advanced defenses. 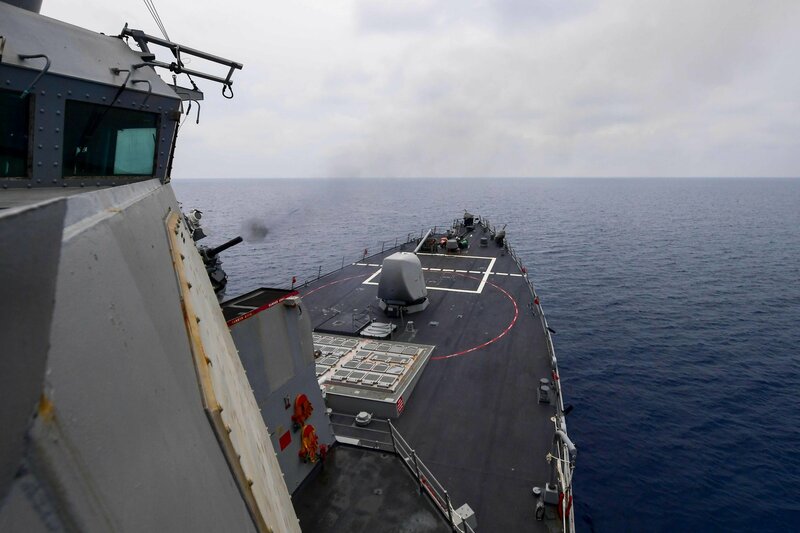 Meanwhile, the Pentagon has flexed its yet-unrivaled global reach with U.S. ambassador to Russia John Huntsman joining a dual aircraft carrier strike group Tuesday in the Mediterranean Sea. The Mediterranean was one of many regions in which Moscow has been expanding its influence, but it was not alone. Iran joined Russia in investing in Syria’s west coast, as did China, which has already bought into ports across the lucrative region. All three of these countries have expressed an interest in developing a more multipolar world order and were among those present at Wednesday’s conference. 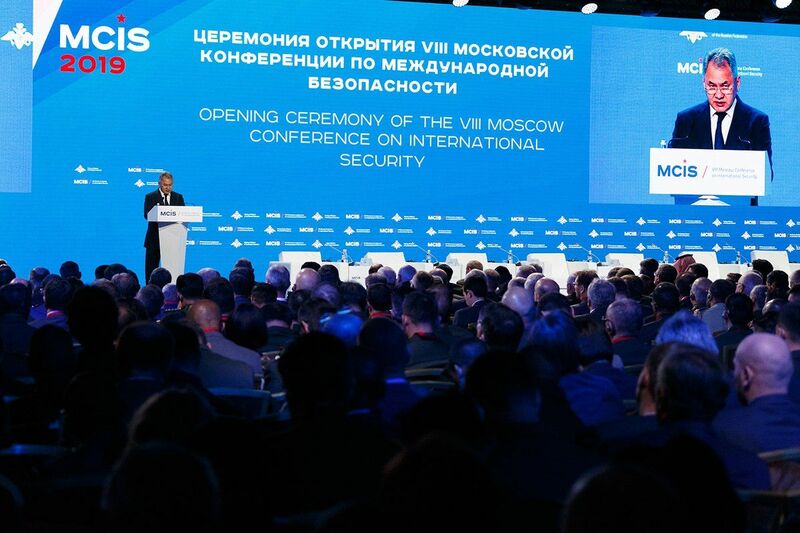 Russian Deputy Defense Minister Alexander Fomin told Moscow-based newspaper Argumenty i Fakty earlier this month that representatives of the U.S. and NATO were invited to attend the annual event but declined. South Korea’s Yonhap news agency published photos of Kim, dressed in a black coat and a fedora, meeting with Russian officials at Russia’s Hasan train station near its border with the North. Russian news agency Tass quoted a local official as saying Kim was given flowers, bread, and salt at the station. Kim was traveling to the Pacific port city of Vladivostok for a summit with Putin on Thursday. He became the first North Korean leader to travel to Russia since his late father, Kim Jong Il, visited in 2011. Earlier Wednesday, the North’s state media confirmed Kim’s departure aboard his khaki-green armored train from an undisclosed location in North Korea. Yonhap, citing an analysis of North Korean photos on Kim’s departure, speculated Kim may have left from a rural area, not Pyongyang. Kim was expected to arrive in Vladivostok around late Wednesday afternoon and attend a dinner reception hosted by Russian Deputy Prime Minister Yury Trutnev, according to South Korean media. After his summit with Putin, Kim may tour neighboring facilities or landmarks before departing for home on Friday, the reports said. Kremlin adviser Yuri Ushakov told Russian media the summit will focus on North Korea’s nuclear program, noting that Russia will seek to “consolidate the positive trends” stemming from President Donald Trump’s meetings with Kim. In February, Kim’s second summit with Trump in Hanoi ended without any agreement because of disputes over US-led sanctions. There have since been no publicly known high-level contacts between the US and North Korea, though both sides say they are still open to a third summit. Kim wants the US to ease the sanctions to reciprocate some partial disarmament steps he took last year. But the US maintains the sanctions will stay in place until North Korea takes more significant denuclearization steps. Some experts say Kim could try to bolster his country’s ties with Russia and China. Others say it’s not clear how big of a role Russia can play in efforts to restart the nuclear negotiations. The summit could allow Putin to try to increase his influence in regional politics and the standoff over North Korea’s nuclear program. “Kim wants to show that he’s cooperating with Russia too, rather than looking to only the US and China. But I think it’s not easy for Russia and China to provide North Korea with practical assistance that leads to the inflow of dollars,” said Chon Hyun-Joon, a former senior researcher at the Korea Institute for National Unification in Seoul. North Korea has increasingly expressed frustration at the deadlocked negotiations. Last week, North Korea tested a new weapon and demanded US Secretary of State Mike Pompeo be removed from nuclear talks. Putin’s adviser added that the Kremlin would try to help “create preconditions and a favorable atmosphere for reaching solid agreements on the problem of the Korean Peninsula,” Ushakov said. Ushakov pointed at a Russia-China roadmap that offered a step-by-step approach to solving the nuclear standoff and called for sanctions relief and security guarantees to Pyongyang. He noted that the North’s moratorium on nuclear tests and scaling down of US-South Korean military drills helped reduce tensions and created conditions for further progress. Ushakov said that Putin-Kim summit’s agenda will also include bilateral cooperation. He added that Russia’s trade with North Korea is minuscule at just $34 million last year, mostly because of the international sanctions against Pyongyang. Russia would like to gain broader access to North Korea’s mineral resources, including rare metals. Pyongyang, for its part, covets Russia’s electricity supplies and investment to modernize its dilapidated Soviet-built industrial plants, railways, and other infrastructure. In the meantime, Vladivostok has been seeing a number of unusually strict security measures. Maritime authorities said that the waters around Russky Island, off the southern tip of Vladivostok, would be temporarily closed to all maritime traffic. The island has a university with a conference hall and is seen as a likely summit venue. Separately, local media reported that some platforms at Vladivostok’s main train station would be closed for several days and that buses will be rerouted from the train station Wednesday. News website Vl.ru reported on road construction to even out the entrance at the train station, possibly to allow Kim’s limousine to drive straight off the platform.